I have not scrapbooked in a while and I am feeling a lack of creativity with these projects. The more I work on it the more I feel it coming back to me, like riding a bike. 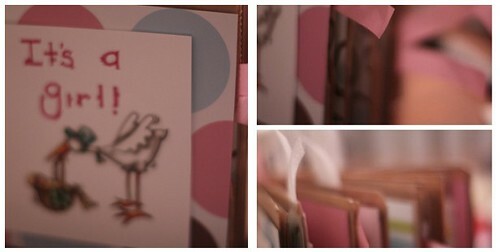 I love mini albums, they are great for a quick project and they are so much fun. Ali posted her 25 days of Christmas album last week and it inspired me to start one too. I also made a brown bag album for a friend who adopted the cutest little baby girl. Technically this should count for day four and five because I worked until 1:00 am. 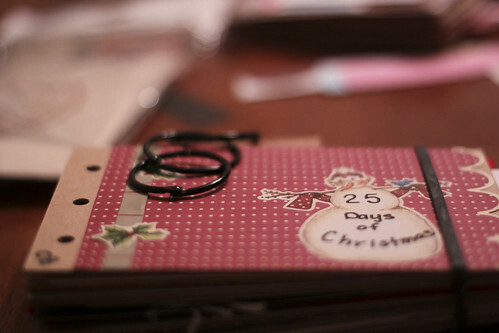 I am hoping that I will get time to work on the 25 days tomorrow night and maybe even finish it. If not, this will have to do. Good for you! I’m tempted to do Ali’s 25 days of Christmas too but I just don’t know where I am going to find the time! The brown bag album looks adorable – I’m sure your friend will just love it! I still need to scrapbook my wedding, actually I wanted to order a fancy book for it but at this point I probably can’t afford it. I need to get into paper crafts. It needs to happen. Scrapbooks are so cool to see, but I would not have the patience for that craft. It means collecting odds and ends which I always seem to accidentally throw out. Used to do tons of scrapbooking years and years ago when the term did not exists and you certainly did not have all the fun little dooh-dads that are available today at Michaels for making awesome scrapbooks. I love the ‘pinkie’ look to your photos today. Great work! I have so many scrapbooks to do it’s overwhelming. They are in the closet so I don’t have to look at them, but I know one day they will all get done. I have hope! Looks like a cute album that will be fun filling with photos! I’ve already forgotten about my photo a day!